Casio's Cassiopeia Pro Super Slim XJ-S35 is very light. Road warriors, take heed: Casio's $1699 Cassiopeia Pro Super Slim XJ-S35 is the thinnest business projector I've reviewed. A scant 1.7 inches tall by 10.6 inches wide by 7.8 inches long, this 3.9-pound, 1024-by-768-resolution (XGA) model is the size of a laptop. The preproduction version I tested impressed me with its portability, usability, and features. Its wide-angle, 2X zoom lens and high brightness of 2000 ANSI lumens let it display a big, clear image under typical indoor lighting. Power zoom and focus controls on both the unit and the remote made adjusting image size and sharpness easy. The XJ-S35 displayed test images well, be they PowerPoint slides, digital photos, or DVD movies. What I admire most about the XJ-S35, though, is how easily it fits into a briefcase. To achieve the unit's slim design and still provide a good cooling system, Casio developed a small lens and light source and added a quiet cooling technology that includes a heat pipe--a first for a portable projector. Inputs include VGA and composite video, along with USB connectivity for image projection from a portable USB drive and for use with Casio's pending USB wireless adapter, available as a $149 option. One limitation: Like many superportable projectors, the XJ-S35 lacks audio support. Although the XJ-S35 costs more than budget-priced XGA projectors do, it weighs several pounds less. If you're traveling light but need a high-quality projector, the Super Slim XJ-S35 is worth a look. 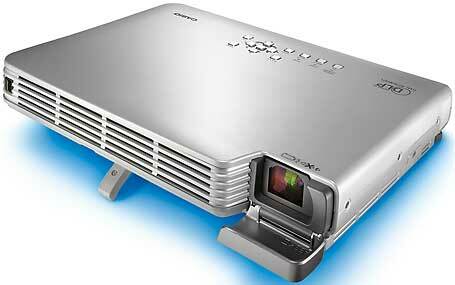 Simple-to-use, compact projector delivers large, bright images for business presentations.